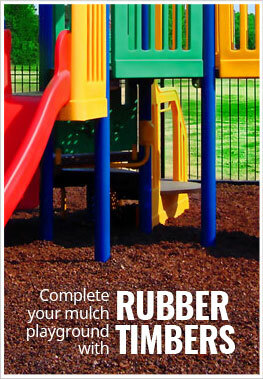 Description - Our Playground rubber mulch is a long lasting and vibrantly colored option for any playground surface. This cost effective alternative to rubber playground tiles can provide certified fall height protection while saving the environment. Each of the six color options is made from 100% recycled car tires keeping them out of landfills. It is non-toxic and cats do not view it as the new cat box. The rubber mulch does not absorb water or float meaning it will provide proper drainage and stay in place keeping your playground beautiful with less maintenance. 2 inch - Recommended thickness landscaping. 3 inches 6’ fall height Recommended thickness for residential playgrounds. 6 inches 17' fall height Recommended thickness for commercial playgrounds. Material – 100% recycled rubber from post consumer waste tire. These colors can fade in the sunlight overtime like any rubber product however these colors are designed to provide the most attractive and durable outdoor mulch surface available. Weight – Can be purchased in 39lb bags. Recommended Uses – Our Playground rubber mulch is designed for use in areas in and around playground equipment, but this has also been used in landscape planters and flower beds in place of rocks, sand or wood chips, in walkways, and in any other area needing an attractive, low maintenance, highly durable, loose surface. Playground Rubber Mulch is virtually maintenance free. But if you do need to clear debris from the mulch such as leaves or grass clippings, you would want to use a blower on a low setting. Since our rubber mulch is heavier than grass clipping and leaves, it will stay in place while the debris is blown away. First, the area where the rubber mulch will lie should be a location that will not hold water or have a slight grade to allow for proper drainage. In areas where drainage could be an issue; it is recommended to install a drain tile system with a 3" base of pea gravel or rock to allow for proper drainage. Heavy duty weed fabric should be installed under the Playground Rubber Mulch to separate the mulch from what lies beneath. Depending on the size of the playground, it is recommended to use large rolls of weed fabric, typically 12' wide, to minimize the number of seams. You would want to use landscape stakes to stake down the weed fabric seams and corners. You will need to make sure that the stakes are completely hammered down. A border is recommended to enclose the playground to contain the mulch, and it is recommended to leave a few inches between the top of the border and the top of the mulch. Finally it is recommended to loosely compact the mulch to either 3 or 6 inches to achieve the desired fall height rating. First you will want to install the Playground Rubber Mulch at 2" depth. Even though it is not required to install the rubber mulch over a permeable weed fabric, it will increase coverage per bag and decrease the risk of weeds. Also, using a felt type week fabric will help keep the mulch in place. If you are installing the landscape mulch over existing mulch/soil, then you want to make sure that the ground is compacted and free of any debris or loose material. Our Landscape Rubber Mulch looks it's best when not mixed with other material. When installing our rubber mulch in plant beds, it is recommended that the beds have a border to help contain the mulch which can be a raised border (i.e., concrete or brick border) or a dug border or trench around the bed of about 2". Coverage – How to easily calculate how many bags of mulch you will need. 39 Lb. Bag covers 1.5 cu. ft.
2000 Lb. Sac covers 75 cu. ft.
Take your square footage and then multiply it by the depth you would like to achieve in feet. Below is a chart of common thicknesses converted to feet. 20 feet x 20 feet x .25 feet = 100 cubic feet. 100 cubic feet / 1.5 cubic feet per 39 Lb. Bag = 67 bags needed. So 67 bags would been needed for a 20' x 20' space at a 3 inch depth. Non toxic and resists fading. Does not compact and does not absorb moisture. Cats do not view at as the new litter box unlike wood mulch. 10 year limited material warranty. Is it the fumes of the rubber mulch that is cancer causing or the actual mulch itself? Our Playground Rubber Mulch is very safe and has not been found to cause cancer. The warning that we have on this product is a mandated label for products sold in the state of California. They mandate this warning for any products that contain materials that they deem are cancer causing. This included toothpastes, deodorants, mouth washes and the like. All of our products are tested regularly to ensure they are safe for children of all ages. If you would like to get a copy of the MSDS sheet for our Playground Rubber Mulch, please feel free to contact one of our flooring heroes. Would this work for doing gymnastics practice outside? I am thinking of putting it around and equestrian vaulting barrel for practice. Our Playground Rubber Mulch would work for this purpose. You would just have to make the mulch thick enough to achieve the fall height rating your are needing. When installing the rubber mulch in a playground should the old wood mulch be removed first? Also, does the rubber mulch heat up during the hot summer days? We would recommend removing all the old wood mulch before installing our Playground Rubber Mulch. The mulch will get warm in direct sunlight, but will be cooler than concrete or asphalt. I want to install the rubber mulch in a new "rock" garden where there will be potted plants & hanging baskets - do I need to install the landscaping fabric in order to prevent weeds? Also, should weeds appear is it OK to spray with a weed killer? We do recommend placing landscaping fabric underneath our Playground Rubber Mulch to prevent the growth of weeds. If weeds were to appear, the use of a weed killer would be warranted. How long does the coloring last on the Playground Rubber Mulch? Does it wash out over time? The Playground Rubber Mulch color will maintain its color even after years of exposure to the elements. The paint on the mulch will fade over time, but not drastically. As advertised, beautiful coloring, easy to install. 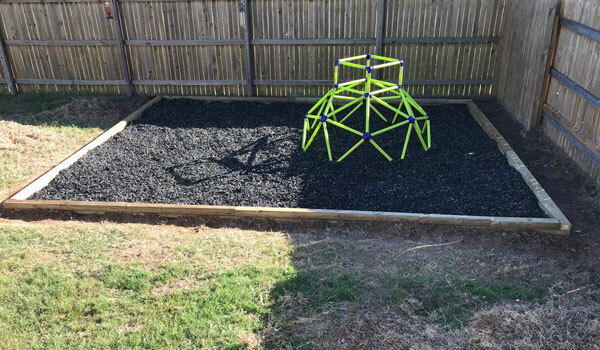 The rubber mulch was used to make backyard play area. Purchased a ton of this stuff for the kids playground area and to go around our pool. It is perfect and looks great!